Additional info on the Curtis P40E Kittyhawk 1A Graphic: The P-40 was superb at low level, but poor at high altitude due to it's Allison engine, the same problem as the P-51 Mustang until changing to Rolls Royce Merlin engines. Siteseen Ltd. are the sole copyright holders of this Curtis P40E Kittyhawk 1A picture, unless otherwise stated. We only authorise non-commercial picture use and particularly encourage their use for educational purposes. 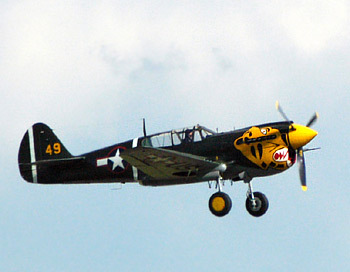 This Curtis P40E Kittyhawk 1A picture is not in the Public Domain. 3) Use of this Curtis P40E Kittyhawk 1A picture, or any of our pictures on websites re-distributing copyright free material is strictly prohibited.